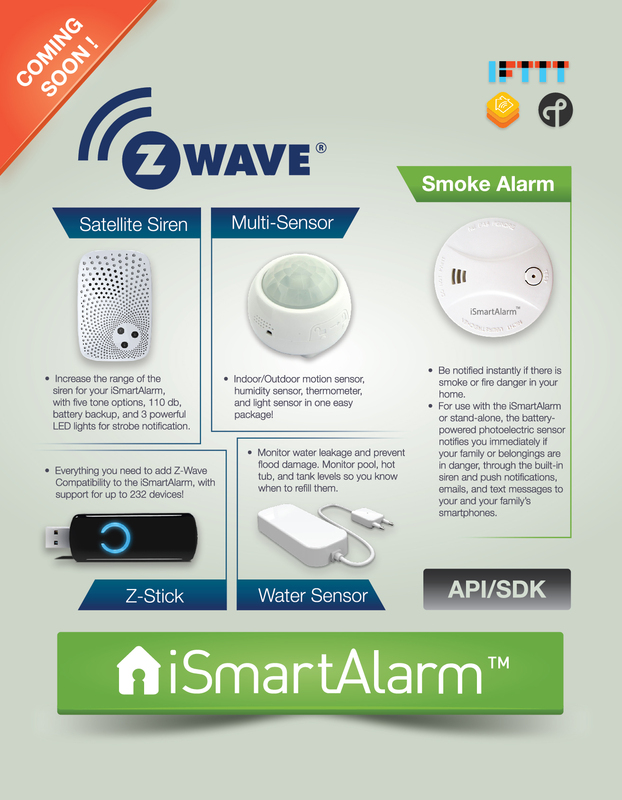 iSmart Alarm, Inc., the two-year old US-based company focused on wireless Smart Home and DIY Home Security products, today announced new wireless devices and technology including Smoke Alarm, Z-Wave Compatibility, water sensors, and more. The iSmartAlarm ecosystem offers users advanced smart home control, security and automation using the iPhone or Android Apps at a fraction of the cost of traditional security companies. The company's flagship product is the iSmartAlarm, which puts a 21st century spin on traditional security systems by offering a self-monitored, self-controlled home security system that is designed to be expandable, mobile and DIY, with no wiring necessary. Families can use and expand the system without worry, and without monthly fees or contracts of any kind. The new iCamera KEEP on-demand streaming and video-recording home security camera offers HD visibility, audio and motion sensors, and no-cost video recording in case of break-ins. The Smart Switch allows iSmartAlarm users to control lights, electronics, and appliances. Both began shipping to Pre-Sale customers in December, and are currently available. The iSmartAlarm App provides seamless access to all approved users in the family. The iSmartAlarm Smoke Alarm is for use as a stand-alone smoke alarm or in conjunction with the iSmartAlarm home security system. Photoelectric sensors minimize false alarms, and receive audible alarms throughout the home. Users will receive notifications of smoke and fire-related emergencies to your smartphone as well, anywhere in the world. The Z-Stick provides all iSmartAlarm families the ability to expand their system to include Z-Wave devices, and will launch with a multi-tone and LED strobe Satellite Siren, Water Leak Sensor, and indoor/outdoor Multi-Sensor (Temperature, air quality, humidity, and light sensors built-in). New devices and sensors will be announced in the near future as well. All iSmartAlarm products and services are part of the continued growth of the iSmartAlarm home control ecosystem, offering users a new level of control, security, and connectivity, allowing anyone to monitor, manage, and secure their home, property and family using their iPhone and Android devices. iSmartAlarm will be demonstrating new products and future plans at PepCom’s Digital Experience! Show January 5, 2015 at the Mirage Hotel in the Mirage Events Center, B&amp;C. iSmartAlarm will be showcasing at CES booth #20336 in the South Hall on Level One January 6-9.
iSmart Alarm, Inc. was founded in Silicon Valley in 2012 on the principles of safety, beauty, and intelligence. They designed and developed the best smartphone-enabled home security and home control system, winning multiple App and design awards along the way, with high ratings from CNet, PC Mag, TechHome, SecurityGem, and others. The sleek, sophisticated system utilizes a free and simple smartphone and tablet app to put home security and home control in the palm of its users' hands. iSmartAlarm products are cool, simple to use, and affordable to everyone. iSmartAlarm protects your home intelligently.